The Griffon Fauve de Bretagne is a medium sized scenthound hailing from the Brittany region or France. Despite the hard to pronounce name, these dogs are anything but high maintenance. They are versatile and courageous hunters while remaining affectionate companions suitable for families. This breed is dog friendly, somewhat low maintenance grooming, and easy to train. They are ideally suited for active owners with yards. While it may sound like a contradiction, the FCI describes the Fawn Brittany Griffon as muscular and bony-- which we take to mean they are lightly muscled for stamina; they stand 19-22 inches at the shoulder with weight in proportion with the aforementioned description. 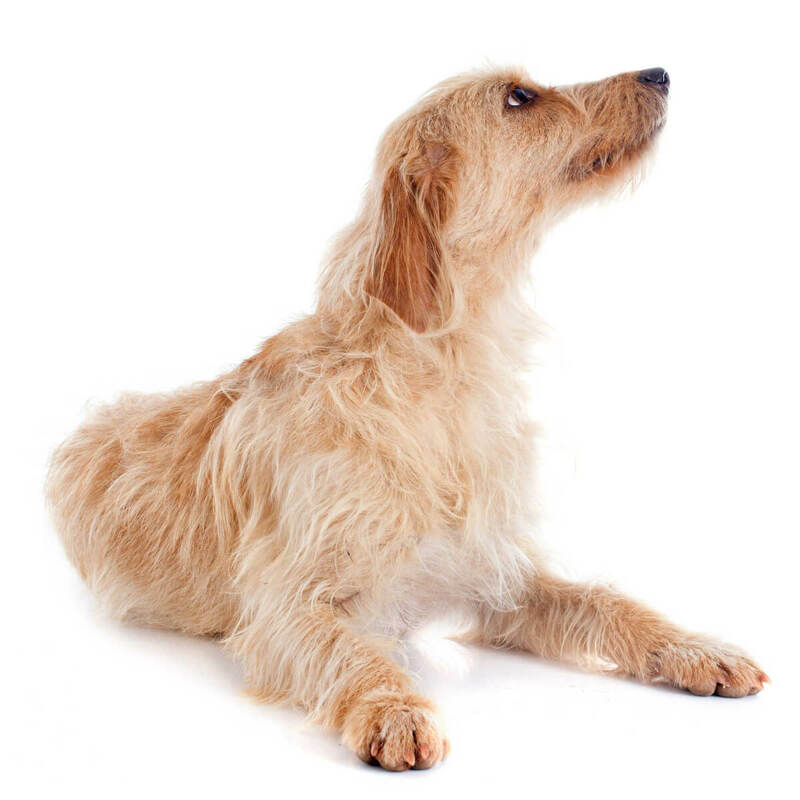 Their characteristic feature is their short-medium length shaggy coat that should be some shade of fawn, golden wheaten or red; the coat is always harsh. They have long, dropped ears and a long tail carried slightly curved. The intelligence of this breed is fairly high. You won't have to spend a ton of time and effort training them; this is especially important when hunting since they tend to be obedient. First time owners will find this an easy introductory breed. Members of this breed are great family dogs due to their affectionate, loyal natures. They should be friendly with other dogs and visitors, however, due to their hunting instincts they will need early socialization to live with small, non-canine pets. 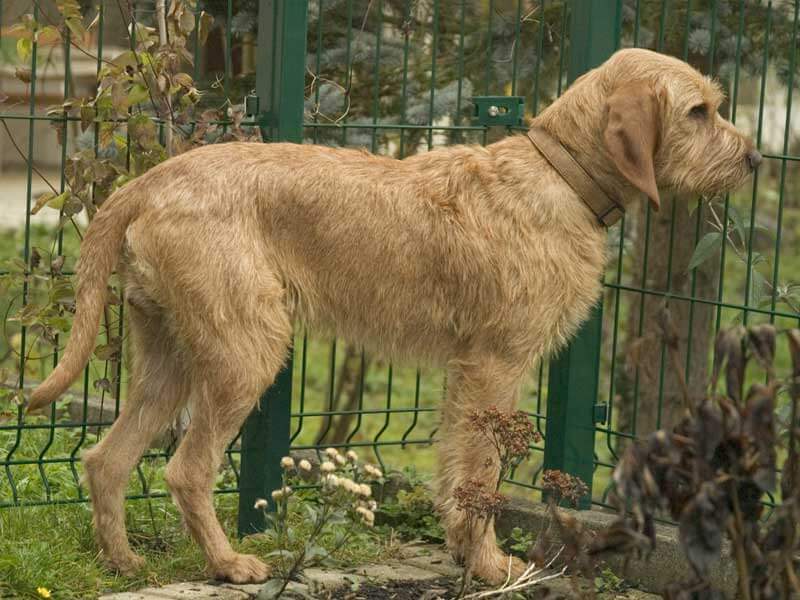 Griffon Fauve de Bretagne dogs are moderately active and do best with a nice big yard or property to run and play. They will need an hour of daily outdoor exercise in the form of long walks, hikes, jogs, trips to the dog park and, of course, hunting time! Failing to meet the exercise needs of your dog may result in destructive behavior. 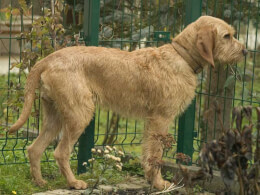 The Griffon Fauve de Bretagne temperament has two facets. While on the hunt they are tenacious and courageous, tracking all types of game with passion and plenty of stamina! The other side of the coin has them as affectionate, social and friendly companion dogs. Training is on the easier side, even for a first time owner and, while hunting is their preferred activity, they can get on well with an active owner. This breed is a good family dog and does well with other pets; early socialization is recommended with non-canine pets since these guys are natural hunters. The GFdB is not an aggressive dog and will probably be social with your visitors. Below are pictures and images of the Griffon Fauve De Bretagne. Not much information exists to attest to the health of the Griffon Fauve De Bretagne but they are known to have a lifespan of 12-13 years. Perhaps they truly are a breed with few health concerns, however, always be prepared for the most common of canine issues such as bloat and hip dysplasia. The shaggy coat of this breed makes it imperative to keep the eyes and ears clean to prevent infections. The best way to prevent taking home an unhealthy puppy is to choose a reputable breeder that offers proof of health (certificates for hip and eye, genetic testing results, etc.) for the dam and sire.